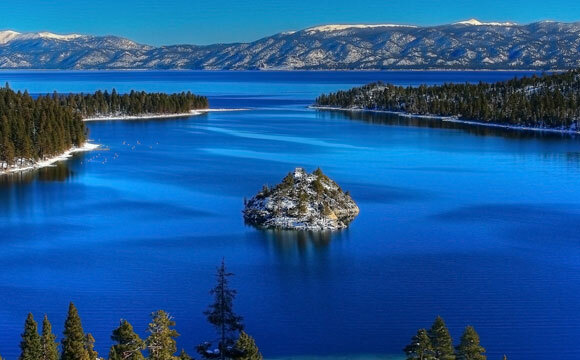 New research from UC Davis and NASA reveals that the blueness of Lake Tahoe is controlled by algal concentration, which in turn is driven by the level of nutrients available to the algae. Lake Tahoe’s iconic blueness is most strongly related to algae, not clarity, according to research released today from the UC Davis Tahoe Environmental Research Center, or TERC. In the “Tahoe: State of the Lake Report 2015,” researchers found the lower the algal concentration, the bluer the lake. The report also includes updates related to clarity, climate change, drought and new research at Lake Tahoe. The assumption that lake clarity is tied to blueness has driven advocacy and management efforts in the Lake Tahoe Basin for decades. But the report’s findings show that at times of the year when clarity increases, blueness decreases, and vice versa. This is due to the seasonal interplay of sediment, nutrients and algal production as the lake mixes. Clarity is controlled by sediment. Blueness is controlled by algal concentration, which in turn is driven by the level of nutrients available to the algae. Low precipitation helped keep runoff from both nutrients and sediment low in 2014. Shohei Watanabe, a postdoctoral researcher at UC Davis TERC, led the blueness study in collaboration with NASA-Jet Propulsion Laboratory and Laval University. He produced a Blueness Index, quantifying Lake Tahoe’s color for the first time by using data from a NASA-JPL research buoy at the lake and hyperspectral radiometers that measure the amount of light leaving the lake at each waveband — in other words, its color. Watanabe combined the Blueness Index with TERC measurements of Secchi depth — the depth at which a white disk remains visible when lowered into the water. He was surprised to see that blueness and clarity did not correspond. In fact, they varied in opposite directions. The JPL buoy used in the study is one of four established by NASA with support from TERC to calibrate and validate measurements taken by satellites flying overhead. With little rain, fewer contaminants washed into the lake. Climate change: Warm, dry conditions continued for the third straight year in 2014. The average annual minimum and maximum air temperatures at Tahoe City were the highest recorded since 1910. Precipitation was only 61 percent of average, with only 18 percent of it falling as snow, well below normal. April snowpack in the Tahoe Basin was the lowest recorded in 100 years of record keeping. Evaporation: The largest water loss from Lake Tahoe is from evaporation. In 2014, 52 inches of water evaporated from the lake. One inch of evaporation is equal to 3.5 billion gallons of water. Lake level fell below the natural rim on Oct. 16, 2014, stopping the outflow of Lake Tahoe water to the Truckee River. By the end of 2014, the final lake level was a half-foot below the rim. Lake temperature: Annual average surface temperatures reached an all-time high of 53 F, and winter experienced that season’s warmest surface water temperature in the lake’s recorded history. Mixing. Lake Tahoe did not mix to its full depth for the third consecutive year, due to warmer water and record-high levels of lake stability (resistance to mixing). This lack of deep mixing also led to the highest nitrate-nitrogen levels on record, 20 micrograms per liter. Biology: Attached algae around the margins of the lake were at record-low values, largely due to the very low lake level. The State of the Lake report informs nonscientists about the most important factors affecting lake health and helps influence decisions about ecosystem restoration and management within the Lake Tahoe Basin. The 2015 State of the Lake report was funded by the California Tahoe Conservancy, IVGID Waste Not Program, League to Save Lake Tahoe, Parasol Tahoe Community Foundation, Tahoe Area Sierra Club, Tahoe Fund, Tahoe Lakefront Owners Association, Tahoe Regional Planning Agency, Tahoe Water Suppliers Association, Toiyabe Chapter of the Sierra Club, and the generosity of supporters who value the role of science to save the lake. TERC partners with other research institutions and with resource agencies in the Tahoe Basin to address the current challenges facing Lake Tahoe. Be the first to comment on "Less Algae Gives Lake Tahoe Its Blue Color"